I designed the Tomb of the Serpent Kings as a "learning" dungeon for new players. When you first start up Super Mario Bros, the game doesn't give you any instructions. The first level is cunningly designed to teach you the rules: jump on enemies, pick up mushrooms, look for secrets, get coins, avoid pits. There is no tutorial. The game itself is the tutorial. This dungeon is designed to take a group of non-gamers - even non-video-gamers - and teach them the basics of dungeoneering. The first rooms branching off the entrance hall (1) are two identical burial chambers (2A, 2B). Each chamber contains a wooden coffin with a clay statue of a snake-man warrior inside. The statues are hollow and contain a gold amulet worth 1gp, a dried snake skeleton, and a cloud of poison gas (d6 damage, can only reduce a PC to zero HP). Lessons: the dungeon is organized. There are patterns. There is hidden treasure. There is also hidden danger. The PCs will probably approach the 2nd coffin with more caution, and earn the reward (gold) without the danger (poison) by using their brains (and a rock or a long pointy stick). Next, there are 2 more burial chambers. Room (3) contains a snake-man scholar statue in a coffin, but his scrolls have crumbled to dust. His clay statue still contains an amulet (and a snake skeleton, and poison). Room (4) contains another coffin, but this one contains a snake-man sorcerer. He is wearing a silver ring. If the PCs didn't discover the other statues were hollow, they'll almost certainly try to pry the ring off, breaking the statue open and revealing the poison gas and the amulet. The ring is a magic ring, but it is also cursed. If it is worn on a finger, the fingernail becomes long, bifurcated, and pointed like twin fangs. It can be used as a poison dagger, but each morning, the wearer must Save vs Poison. If they take 6 damage at once from the poison ring, their finger falls off and turns into a snake. Lessons: Hidden treasure can be magical and useful and sometimes cursed. The passage ends in a barred door (5). The heavy stone bar hangs off two iron pegs. It requires at least 3 PCs to lift. When the bar is lifted off the iron pegs, a trap is activated. A huge stone hammer swings down from the ceiling, aiming straight at the now-trapped PCs. They have they back to the hammer, and their are carrying a stone bar. The hammer fills almost the entire corridor. This trap can be identified by examining the door closely, or by checking the ceiling. It can be disarmed by rigging up a system to lift the bar off while the PCs stand at a save distance, cutting the chains in the ceiling, or tying the iron pegs to the floor. Anyone hit by the trap dies. If you really want to roll damage, use 5d6. The PCs can a) Save to dodge or b) use another PC as a springboard, giving them +2 to Save but giving the shoved PC a -2 to Save. The type of PC, and type of player, might be revealed here. Lessons: there are deadly traps. The dungeon can be lethal. The hammer slowly retracts into the ceiling unless blocked. 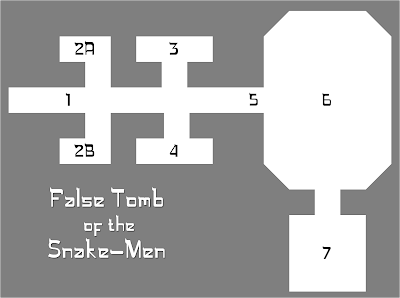 The impact does knock open the doors to room (6), the burial chamber of the snake-man king and his two brides. The king and his brides are skeletons, and will attack if their coffins are disturbed. Lessons: there are undead in the dungeon. They take less damage from slashing weapons. PCs can use the environment against them (lure them into the hammer trap). Room (7) contains a giant statue of an ugly snake-man god. Water leaking into the tomb has eroded the floor, revealing a secret passage under the statue to the True Tomb. Lessons: there are secret passages. They are associated with statues. This might be a false tomb. Hey, this actually seems like it would accomplish its goal of being a teaching dungeon. I like it. I'm gonna repost it. Very good - I've often tried to include "training level" bits at the start of convention games. This looks like a great way to teach the game.